So true. We're cheated out of chocolate. Oh! Feeling a tad snarky after the chair? hahaha! My dear Spinster - I saw on the news today that Reese's has a vending machine that lets you trade your disliked Halloween treats for Reese's treats. 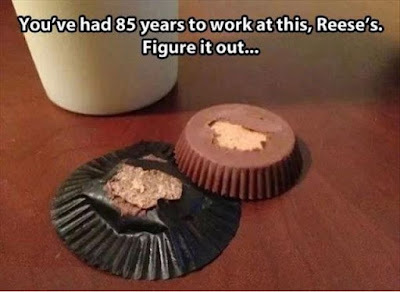 No contest - even flawed, Reese's are better than many other 'treats'!!! Hope the rest your week goes better & that all your Reese's stay intact. What a good way to indulge either during or after chair time! 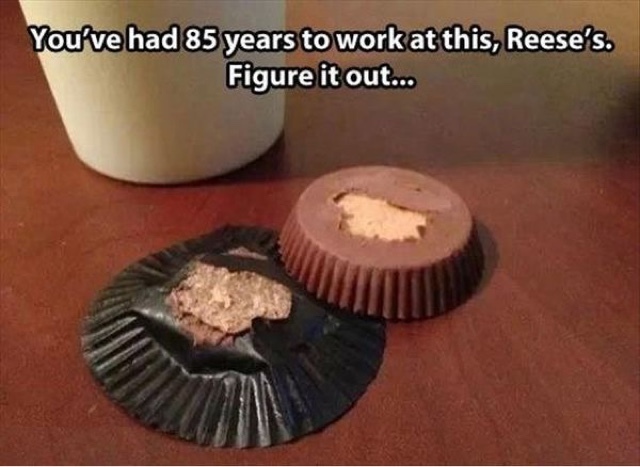 I find that if I store my Reese's Cups in the refrigerator, all the chocolate stays ON the cup and not on the paper. Not that I truly mind licking off the paper if it means I get ALL the goodies. Happy Halloween to you too from a diabetic person who has eaten candy today. Bad girl!! !